"Have you ever licked a lamp post in winter?" Alistair was raised as the foster child of two nobles who treated him well, but also expected him to work. From an early age he was a bit of a trouble-maker with a sarcastic streak, but he was able to temper it and knew when to stop. As a young adolescent, his foster parents struck a deal with a nearby order of religious warriors; the deal included their taking over training Alistair, exploiting his innate talent at dispelling magic. The young man generally chafed more than most apprentices and found the warrior-monks intolerable and oppressive. He soon became known as an underachiever due to his poor attitude. His skills were developing quite nicely, but he had difficulty dealing with authority that kept the trainees under thumb. The religious monks soon became embroiled in a dispute with a nearby tribe of wood elves. A member of The Grey, a traveling order of warriors was meeting with the elves and offered his services to broker the dispute. As a lowly task, Alistair was assigned to this warrior to show him around and attend to him. This Grey soon saw that Alistair had a mind and level of moral development that was unsuitable to the monks, and after brokering the deal he engineered Alistair's escape and offered him a position within the Grey, which he readily accepted. The monks were generally glad to be rid of Alistair, but squeezed a payment out of his foster parents. 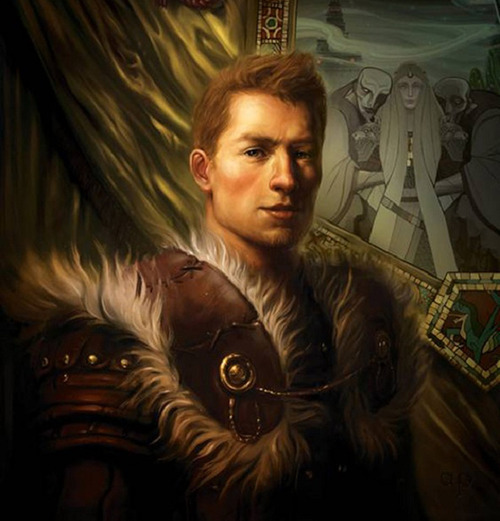 Mere months later Alistair's mentor was slain in combat, requiring Alistair to assume his duties. He currently travels the realm, typically alone or with another Grey, carrying out his order's mission to protect the weak through direct intervention and by brokering disputes that allow everyday folk to continue their lives peacefully.